Mesh implants are used by surgeons to treat conditions which some women suffer after childbirth, with the synthetic substance used to repair damaged or weakened tissue. The use of mesh in Scotland was suspended in all but "exceptional circumstances" in 2014 after it emerged some women had suffered painful side-effects but the procedure has still been used hundreds of times since. Law lecturer Ms McLaughlin, from Belfast, said she found out about Dr Veronikis on the internet and claimed that his kind of surgical expertise is not available on the NHS. She added: "The government has had 20 years for tea and sympathy conversations with patients with mesh, and it has to be admitted that the ball has been dropped. "The surgeons use a small piecemeal approach where they take a little bit of the mesh out, see how the patient fares and then take another little bit of the mesh out. "Dr Veronikis does this operation in one." Over the past 20 years, more than 100,000 women across the UK have had transvaginal mesh implants, which are used to treat pelvic organ prolapse (POP) and stress urinary incontinence (SUI), often after childbirth. 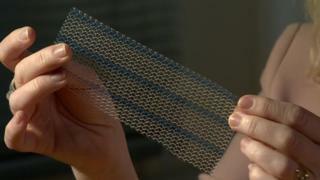 The mesh, usually made from synthetic polypropylene, is intended to repair damaged or weakened tissue. While the vast majority of women suffer no side-effects, others have reported chronic and debilitating pain, with some being left unable to walk. Mesh campaigners say thousands of Scottish women are suffering the effects of mesh implants and almost 600 are taking legal action over the procedures. Last year a Scottish government-commissioned report was critical of the way a previous review of the procedure was carried out, saying it suffered "systemic" failings and potential conflicts of interest. NHS England has recently curbed the use of mesh on safety grounds, although it is still available as a treatment of last resort for some. If Dr Veronikis was going to operate in this country he would have to be registered with the General Medical Council as is the case with all British surgeons. A Scottish government spokeswoman said: "We know there are many patients who have suffered pain and life-changing complications following mesh implant procedures - and we sympathise hugely with them and their families. "Health boards are aware that Dr Veronikis has been reported as being willing to visit Scotland. While boards are directly responsible for surgical staff and their development, we would be happy to discuss with both boards and professionals funding of additional education and training where a specific need is identified. "Full mesh removal, where this is the correct course of action, has already been provided by specialist staff working here in Scotland. The decision to remove mesh will be made by the patient in consultation with her clinician and will take into account her particular circumstances."